At Kingfisher Dental Designs, we offer tooth-colored fillings as a dental restoration. White fillings are now made with materials that offer the durability we've come to expect from amalgam fillings. Amalgam dental fillings darken over time, and large fillings may cause outlying enamel to appear gray. Amalgam dental fillings sometimes require the dentist to remove more of the tooth structure. 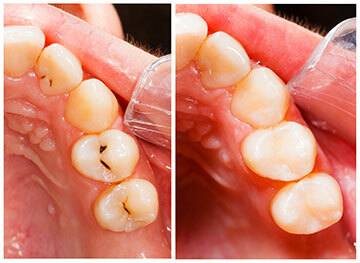 With composite fillings, only the diseased part of the tooth is removed, helping to preserve more healthy tissue. Composite fillings can be done in just one dental visit. Composite resin and porcelain are excellent alternatives for patients with rare metal allergies. As some believe mercury toxicity has been linked to certain medical conditions, they may choose tooth-colored fillings as a prevention method. But throughout its long history, there has been no proof that amalgam causes any disease, deeming it a safe filling material by the American Dental Association and many public health groups.